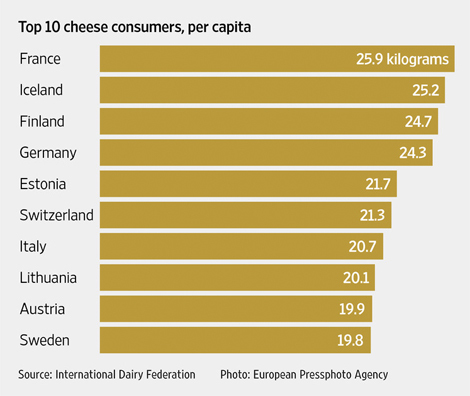 The top ten cheese-eating countries are all European, led by fromage-loving France. There is something deeply unfair about the fact that France, the country that consumes the most cheese per capita, also has some of the lowest obsesity rates in the Western world. According to data from the International Dairy Federation, French people ate the most cheese last year out of any country—an impressive 25.9 kilograms (57 pounds) per person. And here’s a chart of the other end of the spectrum, the countries that ate the least fromage last year. 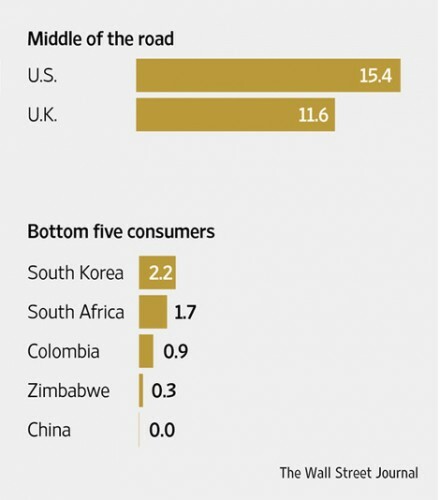 Although the graph shows that China ate no cheese, this isn’t quite true. “The Chinese ate 49,000 tons of cheese in 2013, a number which, when divided by the population of 1.3 billion, equals 0.000037 tons each,” explains the WSJ. While China consumed less cheese than any other country, imports were up 22% more than the previous year. This reflects a growing trend in Asia where people are eating more cheese as fast food (especially pizza) becomes more popular, and as the population becomes more affluent. In other words, as they become more like us. Although the average American only ate 15.4 kg (34 pounds) of cheese last year, we’re still the fattest country in the world. Can’t imagine why.